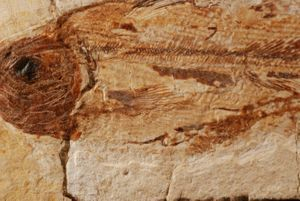 Abstract: A new fossil species of Coelacanth Fish from the Upper Cretaceous (Middle Cenomanian) of the genus Macropoma (Class Sarcopterygii, Subclass Crossopterygii, Order Coelacanthiformes, Suborder Latimerioidei, Family Latimeriidae) was found in the Limestone of Haqel (Hakel) and Hajula, Lebanon. 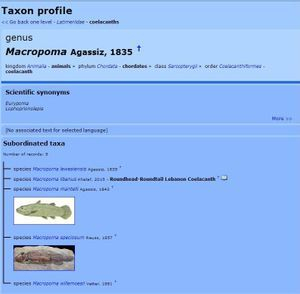 The new fossil species is distinguished from the four different Macropoma species : † Macropoma lewesiensis Agassiz, 1835; † Macropoma mantelli Agassiz, 1843; † Macropoma speciosum Reuss, 1857 and † Macropoma willemoesii Vetter, 1881 by its slightly different skeletal, skull and fin features. It is morphologically a distinct species. The new species was named † Macropoma libanus Khalaf, 2015. 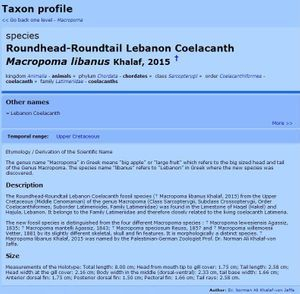 Keywords: Sarcopterygii, Coelacanthiformes, Latirmeriidae, Macropoma libanus, Coelacanth, Lebanon Coelacanth, Roundhead Roundtail Lebanon Coelacanth, Fossil, New species, Upper Cretaceous, Middle Cenomanian, Haqel, Hakel, Hajula, Lebanon, Near East, Middle East. 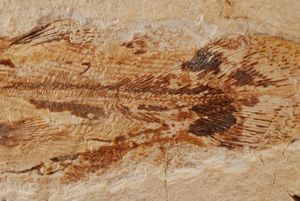 When I was writing some articles about the Coelacanth Fishes, I noticed that there were some Lebanese Coelacanth fish fossil specimens for sale on the internet and other specimens were in Museums or Private Collections. One coelacanth fish fossil specimen was for sale on eBay. It looked peculiar. It was from the Upper Cretaceous (Middle Cenomanian) Limestone in Haqel (Hakel) and Hajula, Lebanon. This specimen was examined and measured. The total length was 8.00 cm. The new fossil species is distinguished from the four different Macropoma species: † Macropoma lewesiensis Agassiz, 1835; † Macropoma mantelli Agassiz, 1843; † Macropoma speciosum Reuss, 1857 and † Macropoma willemoesii Vetter, 1881 by its slightly different skeletal, skull and fin features. It is morphologically a distinct species. The new species was named † Macropoma libanus Khalaf, 2015. Macropoma (meaning big apple or large fruit in Greek) is an extinct genus of coelacanth in the class Sarcopterygii. These fishes have apparently been extinct for over 70 million years and are most closely related to the modern coelacanth Latimeria (Wikipedia). 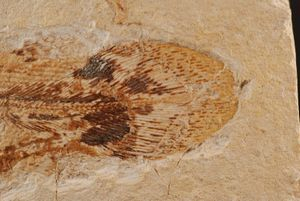 Fossils of Macropoma have been found in both England and Czechoslovakia. The presently described fossil comes from Lebanon. Recorded fossils have bodies less than two feet in length. A modern coelacanth measures five or more, but in other respects the two genera are remarkably similar, and share the same body plan with a three-lobed tail and stalked fins (Wikipedia). Macropoma grew to a length of 22 inches (55 centimeters) and would have preyed upon smaller aquatic species (Wikipedia). Total length: 8.00 cm; Head from mouth tip to gill cover: 1.75 cm; Tail length: 2.58 cm; Head width at the gill cover: 2.16 cm; Body width in the middle (dorsal-ventral): 2.33 cm, tail base width: 1.66 cm; Anterior dorsal fin: 1.75 cm; Posterior dorsal fin: 1.50 cm; Pectoral fin: 1.66 cm; Tail rays: 2.58 cm. The genus name Macropoma in Greek means “big apple” or “large fruit” which refers to the big sized head and tail of the Genus Macropoma. The species name libanus refers to “Lebanon” in Greek where the new species was discovered. After studying the Macropoma fish fossil specimen from Haqel (Hakel) and Hajula, Lebanon and comparing with the four different Macropoma species : † Macropoma lewesiensis Agassiz, 1835; † Macropoma mantelli Agassiz, 1843; † Macropoma speciosum Reuss, 1857 and † Macropoma willemoesii Vetter, 1881 and referring to many zoological references, and searching the Internet, I came finally to a conclusion that we are in front of a new Coelacanth fossil species. I gave it the scientific name † Macropoma libanus, new fossil species. The species name “libanus” is for Lebanon, from where the fossil specimen was found. Scientific Binomial name: † Macropoma libanus Khalaf, 2015. Authority: Prof. Dr. Sc. Norman Ali Bassam Khalaf-von Jaffa. 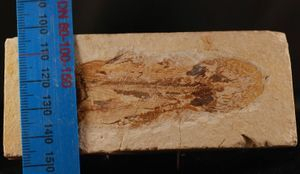 Holotype Fossil: ML-1, eBay specimen. Origin: Haqel (Hakel) and Hajula, Lebanon. Attenborough, David (1979). Life on Earth. Collins, London, Glasgow, Sydney, Auckland, Toronto, Johannesburg, and the British Broadcasting Corporation, London. 319 pp. Bone, Quentin and Moore, Richard H. (2008). Biology of Fishes. 3rd (third) edition. published by Taylor & Francis, New York. Boyd, A.J. and J.D. Hewitson (1983). Distribution of anchovy larvae off the west coast of southern Africa between 32 degree 30' and 26 degree 30'S, 1979-1982. S. Afr. J. Mar. Sci. 9:53-67. Casane D, Laurenti P (2013) Why coelacanths are not ‘living fossils’: A review of molecular and morphological data. Bioessays 35: 332–338. Forey, P. L. (1988). Golden Jubilee for the Coelacanth Latimeria chalumnae. Nature, 336: 727-732. Forey, Peter L. (1997/1998). 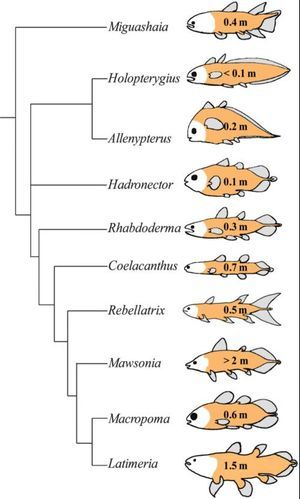 History of the Coelacanth Fishes. London: Champan & Hall and the Natural History Museum. pp. 440. Gaudant, J. (1975). Intérêt paléoécologique de la découverte de Gobius aries (AG.) (Poisson téléostéen, Gobioidei) dans l’Oligocène des bassins de Marseille et de Saint-Pierre-lès-Martigues (Bouches-du-Rhône). Geol Mediterran 2: 111–114. Gayet, M. and F.J. Meunier (2000). Rectification of the nomenclature of the genus name Ellisella Gayet & Meunier, 1991 (Teleostei, Ostariophysi, Gymnotiformes) in Humboldtichthys nom. nov. Cybium 24(1):104. Goldsmith, N. F., Tchernov, E., Ginsburg, L., Tassy, P., and Van Couvering, J. A. (1982). Ctenodactylid rodents in the Miocene Negev fauna of Israel. Nature, 296 (5858): 645-647. Khalaf-von Jaffa, Norman Ali (2005). The Coelacanth (Latimeria chalumnae) in the Science and Natural History Museum, State of Kuwait. In : Aquatica Arabica. An Aquatic Scientific Journey in Palestine, Arabia and Europe between 1980 - 2005 / Aquatica Arabica. Eine Aquatische Wissenschaftliche Reise in Palästina, Arabien und Europa zwischen 1980 - 2005. ISBN 3-00-014835-3. Erste Auflage / First Edition, August 2005, pp. 110-117. Self-Publisher: Norman Ali Khalaf, Rilchingen-Hanweiler, Bundesrepublik Deutschland & Sharjah, United Arab Emirates. Khalaf-von Jaffa, Prof. Dr. Norman Ali Bassam (2014). 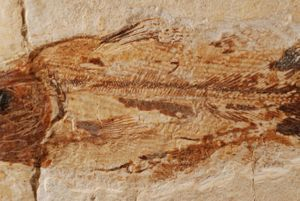 † Macropomoides palaestina Khalaf, 2013 : A New Coelacanth Fish Fossil Species from the Anthracothere Hill in Al-Naqab, Palestine. In: Fauna Palaestina – Part Four. Zoological Studies in Palestine between 1983 – 2014 / Fauna Palaestina - Teil Vier. Zoologische Studien in Palästina zwischen 1983 – 2014. ISBN 978-9950-383-77-7. Erste Auflage / First Edition : July 2014, Ramadan 1435 H. pp. 126 - 138. Publisher: Dar Al Jundi Publishing House, Al-Quds (Jerusalem), State of Palestine. Millot, J. and J. Anthony (1958). Anatomie de Latimeria chalumnae. Tome I. Squelette et Muscles et formations de soutien. Centre National de la Recherche Scientifique CNRS, Paris (Tome 1):122pp+ill. Schaeffer, B. (1977). The dermal skeleton in fishes. in “Problems in Vertebrate Evolution,” S. M. Andrews, R. S. Miles and A. D. Walker, eds., Academic Press London. Smith, J.L.B. (1939). 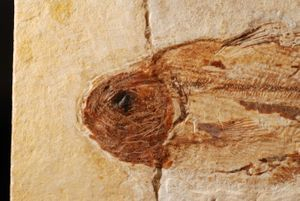 A surviving fish of the order Actinistia. Trans. R. Soc. S. Afr. 27: 47-50. Smith, J.L.B. (1940). A living coelacanthid fish from South Africa. Trans. R. Soc. S. Afr. 28: 1-106. Smith, M.M. (1986). Latimeriidae. p. 152-153. In M.M. Smith and P.C. Heemstra (eds.) Smiths' sea fishes. Springer-Verlag, Berlin. Vorobjeva, E.I. and Obruchev, D.V. (1967). Subclass Sarcopterygii, pp. 480-498. In: Obruchev, D.V. (ed.). Fundamentals of Palaeontology, 11, Jerusalem: Israel Program for Scientific Translations. Weinberg, Samantha (2001). A Fish Caught in Time: The Search for the Coelacanth. New York: Harper Perennial Publishing. Woodward, A. S. (1942). Some new and little-known Upper Cretaceous Fishes from Mount Lebanon: The Annals and Magazine of Natural History, (eleventh series), n. 56, p. 537-648.